Kent head coach Jimmy Adams says the side will benefit in the long-term from losing captain James Tredwell to international duty. The 30-year-old off-spinner has been a fixture in England's one-day side in India and New Zealand this winter. Adams told BBC Radio Kent: "Part and parcel of leadership is the experience you get over the course of your career. "I am sure it will be something he will apply positively; not just to his captaincy but his cricket as a whole." He added: "Nothing beats international experience. "From a club perspective we are all really proud that we have an international, not only in the team but also leading the team." 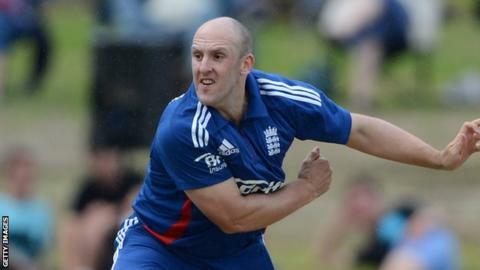 Tredwell played in all five games of the one-day series defeat in India last month, taking 11 wickets. And Adams says he is prepared for the eventuality of losing Tredwell for parts of the upcoming county campaign. "One of the issues you have to cater for is the fact occasionally he will be called away for duty," the former West Indies captain continued. "We lost both him [Tredwell] and Matt Coles at various points last season. It is something we are alive to. "Barring something unforeseen in New Zealand, he is probably setting himself up for quite a bit of white-ball cricket for England over the summer. "It will be a loss to us at the time but we also have a chance to turn it into a positive. "I'd always prefer to have my players playing international cricket. Yes we miss them, and we could do with having them to strengthen the squad, but not at the expense of having players who come back with international experience. "I think we get more from them and the group will benefit more from having that experience when they are here. Meanwhile Adams says that Tredwell, who came through the academy at Canterbury, provides a positive role model for young cricketers in Kent. "Having somebody who has come through the ranks here at Kent, the value to younger players is that it's great to understand you can come through club cricket and play internationally," he said. "It's a wonderful advert for what the possibilities are for any kid in Kent. "When you have youngsters in the squad, it's a huge bonus to have had someone who has gone through the processes they are going through and is wearing the national badge."